Bill Freeman just lost another point with me today with a Facebook post in which he says he would use eminent domain to take PSC Metals property for redevelopment. Eminent domain is the government taking of ones property for a public use. Traditionally "public use" meant taking a property to build a road or a school or some such use. Starting in the 50's with urban development government began taking property to clear blight. Now "public use" means we don't like what you are doing with your property and we will take it away form you and give it to someone else who will do something better with it. One of the most egregious examples of abuse of eminent domain in Nashville is the city taking hundreds of acres west of Vanderbilt University sometime in the 60's and giving it to Vanderbilt. Hundreds of people were forced out of their homes and much of the land still sits vacant or used for surface parking. A heroine of the decade-long fight against that condemnation was Fannie Mae Dees who the city named a park after. Many people call that park "the dragon park," but the name of the park is "Fannie Mae Dees." Another high profile fight over condemnation, in which the city lost, was downtown on Church St. It was sometime in the 80's and I was serving in the council at the time. The city wanted to take the property across from the downtown Presbyterian Church for Third National Bank to build a large bank office building. One of the owner's of a piece of property did not want to sell. This lingered for months in the council and the council was almost evenly split as I recall. The developer redrew their plans as to be able to build their building without taking that particular piece of property and also they offered a much higher price than was originally offered for the property and the owner voluntarily sold. 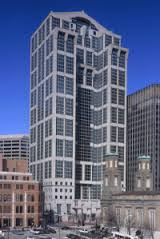 I think that is one of the nicest large building downtown and it was one of the first tall buildings build downtown. The architecture pics up some Egyptian design elements inspired by the historic church across the street and the gabled top of the building reflects the Ryman auditorium design. I would prefer however that the building never be build than to abuse eminent domain to build it. Another high profile local eminent domain case occurred across from Farmers Market when MDHA took Eaton Auto Village property to build some low-income housing. These low-income units are now selling for around $250,000 each. Eaton lost that battle as I recall, but he fought long and hard against MHDA instead of just rolling over. He ended up getting considerably more for his property than what the city offered him by holding condemnation over his head. Kenneth Eaton is a candidate for Mayor. Stories like that of Fannie Mae Dees or Joy Ford may hit a responsive cord with the public because they have a David vs Goliath feature of the little person standing up to powerful abusive government, but to take someone's land against their wishes in order to transfer it to a developer to build upon it just as wrong if we are talking about Joy Ford or PSC metals. 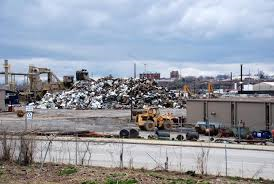 PSC Metals is that ugly pile of scape metal on the east side of downtown, inside the I-24/I-65 loop just on the south side of Korean Veterans Blvd, south of the Titan's stadium. It sits on 55 acres of prime real estate. I admit it is an eyesore. It provides a valuable function however in recycling middle Tennessee's junk cars and appliances and is one of PSC's most profitable sites. To relocate, PSC would have to have a comparable site with rail, interstate and barge access. That might not be easy to find. Other mayors have tried to get PSC to relocate for decades but without success and without resorting to eminent domain. The advocacy of using eminent domain to take a piece of property to turn it over to developers has made Bill Freeman, almost out of the running for someone I could support for mayor. The reason I say "almost" is because it seems like when one candidate takes a position all the others line up and say "me too." From continuing to subsidize General Hospital, to advocating home price-fixing called "inclusionary zoning," to eagerly wanted to be the first mayor to perform a gay wedding in the court house, all the major candidates have the same position. Megan Barry and Howard Gentry are already out of the running as far as getting my vote. Megan Barry because of her progressive voting record in the Metro Council and Howard Gentry because he thinks the Music City Star is a model of how we ought to pursue developing mass transit. If the other candidates step forward and say they also would use eminent domain to take PSC metals, then they will have follow to the level of Bill Freeman and Freeman will again be in the running to get my vote. I am waiting and I am hoping a candidate will disagree with Freeman and say it is wrong to take a person's property just because it is ugly and someone else can develop it to a higher use and a use that will generate more tax revenue. If a candidate said that, that would likely be the candidate I would support for mayor. in new radio ads he also is called "Democrat Bill Freeman", and in the spanish language one Mr. Ramos calls tea party folks "extremists". Bill Freeman was a major bundler for Obama. His campaign manager worked for Comrade DeBlasio in NYC. I know we'll probably get stuck with another tax and spend liberal mayor like Karl Marx Dean, but I'll be damned if I'm going to vote for Bill Freeman who raised millions for the worst President in American history.